Sports diagnostic represents a major process control, planning and implementation of the training process, through science. Today it is more developed, implemented and improved. The benefits of this way of relating to sports and athletes, and some other interesting things about these topics, we will present in the following text. One of the biggest problems in modern sport is that the coaches for many years run by the old “proven” method. One of the problem apparently is to give some information about what is happening towards the athletes and those (in) adequate information trying to plan training. The result is that they have a lack of quality information, while you may have a lack of skills and knowledge to adapt the organism to increased physical efforts and the work carried out. Therefore it is no surprise that information is, since 2000th over 50 players died on the play ground. One gets the impression that it is actually a natural selection, on the principle of survival of the fittest. Half of these accidents occurred in the past 5 years. So it is right time to introduce Science in sport? It is right time to work only the highest quality professionals? It is right time to stop the gambling with young lives? And to understand the value of a young life, and for correcting such errors no second chances? Although there are countless reasons why athletes should be tested, our experts refuse to engage in modern diagnostic flows. Are the reasons for lack of interest and ignorance, or they are still confident in their approx abilities. The system itself allows coaches, after completed secondary school, to go on a weekend seminar, pay a fee and enter into a collective made up of non educated people who have been prescribed the same methods and erroneous, inadequate training damaging their athletes. Problem as a knowledge based on the level of research in the 50s of the previous century, which are not based on practice than on statistics, and thus the figure of 50 deaths of players is only a small part of the overall irrelevant statistics and the amount of players that are in circulation, so it is speak little victim for more interest. Diagnosis is an area still insufficiently developed, because the equipment is expensive and not so many people know how to use it properly. One fact to a diagnostic device can be interpreted in different ways, and therefore the vision of experts takes precedence over education and vocational and profession. The functional state of the organism and testing of athletes, through the prism of the very requirements of a given sport, is something that should be the task of all sports officials. Control techniques, mechanics, posture, muscle status, metabolic processes in relation to sport is much important and this aspect is very easily applicable in the training because they diagnostics and training actually two parts of a puzzle, a puzzle that can bring progress and save many lives. A large number of children suffer from postural disorders, deformities, obesity … but the problem dealing with the parents themselves only when it comes, “5 to 12” or something bad happens. This problem proper access sport in cooperation with diagnostic centers could be minimized through proper functioning of the clubs, not the production of players, could be treated. That can testify to the fact former chief diagnostician FC Schalke who says that there is a system diagnostics on all levels of play, and that the trainers “stack” of paper easily hide in the side because they believe your instincts, and these institutions are becoming more important than scientifically based arguments which are often i do not watch. What’s the point of the test and what we’re actually talking about sport, awareness of experts and the future of our sport? assessment of technical elements with the ball and without the ball (technique sprint, the technique of stopping, change of direction, the technique of movement against the violation of the function of the game, etc.). In the following video we will show how the case looks a diagnostic treatment of the young tennis player. Five lumbar vertebrae that connect our pelvis to the top of the spine.The six discus that protect our vertebra and absorb all incoming attacks. The nerves and spinal cord that conduct impulses to our muscles from the brain and their role is most similar to the “current cables “. Small joints that we provide to all funcion properly and maintain both stability and mobility. Ligaments and muscles without which the function of the spine is unthinkable, because they give us strength and also provide stability. Muscle weakness is due to inactivity. Muscle imbalance is one of the most important causes of pain. Muscle strength of individual muscles and muscle groups should be balanced, harmonious and balanced. With kineziteraphy (medical exercise) is begun when fully relieve the pain. 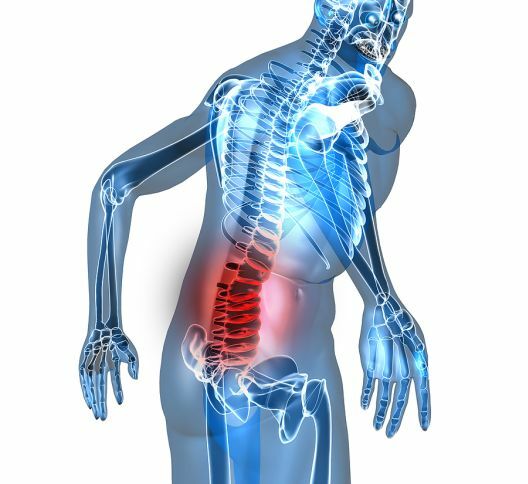 Our goal is to take strong musculature of the burden of the lumbar spine. It is important to note that there is no activity of daily life that strengthens lumbo-sacral spine extensors. Also, there is not a sporting activity that strengthens the muscles of this region. It is the most common cause of these problems. 1. 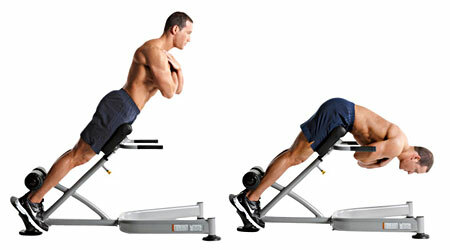 Alternating vertical rise from the ground opposite arm and leg endurance of 10-15 seconds then changes, exercise is performed without a break in the 3 series alternately. Exercises are performed 4-6 times per week at first. 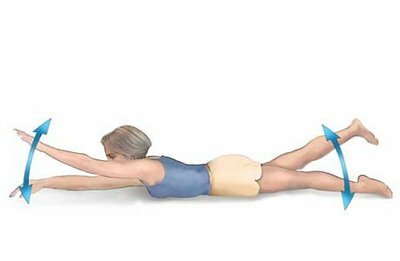 Later, when there was a considerable reinforcement lumbar necessary to maintain muscle tone with working out 2-3 times a week.